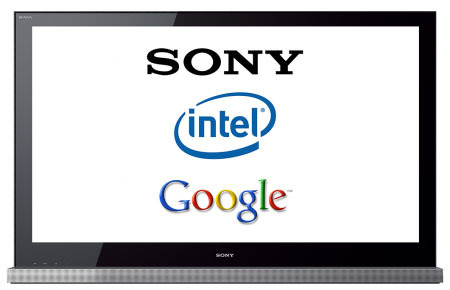 Earlier we have already reported about rumors that Sony is set to launch a Google TV. And now, Bloomberg has reported that Sony corporation is all set to launch the Google TV in May 2010. The televisions will be powered with Intel chips and Google software. Intel is contributing a customized version of its Atom processor that will be running a customized version of Android Operating System known as “Dragonpoint”. Sony is desperately trying to use Intel and Google to produce televisions and Blue-ray DVD players with Internet access. The report says that, Sony and Google have planned to discuss the new products at the conference sponsored by Google in San Francisco on May 19th and 20th. The three companies involved in it have also picked in Logitech to design the remote control for the set-top box and a tiny keyboard for navigation. Intel has said that Atom, a scaled-down version of its computer processors, will create an experience called “Smart TV” — where the Internet access will be integrated with advanced television guides, personal content libraries and search. The Santa Clara, California-based company also had its software engineers create programs that will better take advantage of its chips. Pingback: Sony To Launch Google TV In May | Google ??? ?